Lateral Reducing Ball Valves – Plast-O-Matic Valves, Inc.
Plast-O-Matic Trunnion Ball Valves are available with an adapter and tee for substantially stronger and more compact valve connections to lateral piping. This design eliminates the need for a reducer, additional length of pipe, and one of the end connections on the ball valve. 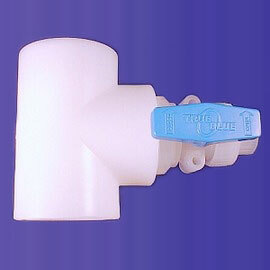 Simplifies connections and protects against pipe breaks in lateral drops.